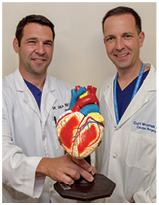 When it comes to matters of the heart, patients of NorthBay Heart & Vascular Center are served by a team steeped in military know-how, from one of NorthBay Healthcare’s long-time cardiologists and a nurse practitioner, who both served in the Air Force, to two lieutenant colonels currently assigned to David Grant Medical Center at Travis Air Force Base. They share their mission to serve, not just the U.S. Air Force, but heart and vascular patients throughout Solano County. Above: Jeffrey Breneisen, M.D., holds a photo of his Critical Care Air Transport Class, taken at Brooks Air Force Base in Texas. Cardiologist Jeffrey Breneisen, M.D., was driving onto Travis Air Force Base the morning of Sept. 11, 2001, when he heard a radio report that a plane had crashed into the north tower of the World Trade Center. Back then, he was the cardiologist on call at David Grant Medical Center. It took a long time to get on base, but once he did, his colleagues were in a state of shock. By then, a second crash into the south tower had been reported. One resident had a brother who worked in one of the towers. Then came the crash at the Pentagon. And then the crash in Pennsylvania. It was a scenario Dr. Breneisen saw several times during his military career. He’d already earned his bachelor’s degree in pre-med from Notre Dame University and was just starting medical school at the University of Illinois when he decided to join the military. He did his officer’s indoctrination at Lackland Air Force Base in Texas. He was stationed at Travis Air Force Base for his residency, and then moved to San Diego at the Naval Medical Center for a fellowship. He returned to Fair- field three years later. After separating from the military in 2002, he worked as a civilian contract cardiologist, later went into private practice and then joined North- Bay Healthcare. Dr. Breneisen and company pose with then-Miss America. One week after she turned 18, Rebecca Parker enlisted in the U.S. Navy and found herself at boot camp in Orlando, Florida. She was no stranger to military life. Her father served in the Army (Special Forces) and instilled in her the core values of honor, courage and commitment from a very early age. “The Navy just reinforced them,” said the nurse practitioner for the NorthBay Heart & Vascular Center. “The military gave me a sense of pride to always be the best I can be with anything I do,” she said, noting that it has carried over to her career in health care. She worked as a civilian at David Grant, helping establish their cardiothoracic intensive care unit in 2010 and joined NorthBay Healthcare in 2017. She often encounters patients with military backgrounds. Dr. Pribyl started in the U.S. Merchant Marine Academy in 1996 and served four years after college in the U.S. Naval Reserve. Then he “crossed over to the Blue” and joined the Air Force in medical school. He has been with the Air Force for 14 years, and started in partnership with NorthBay Healthcare in January of 2017. Lt. Col. Shea Pribyl, D.O., left, and Lt. Col. Curt Wozniak, M.D. Lt. Col. Curt Wozniak, M.D., knew from the time he was in high school that he wanted to be a doctor. His mother, a hospital unit clerk, regaled him with heroic stories of physicians and he thought: I could do that. Based at David Grant on Travis Air Force Base, he started in partnership with NorthBay Healthcare in 2016. The partnership not only allows him to bring his patients to NorthBay hospitals, but it also allows him to be on call for cardiac emergencies. The extra hands-on opportunities help keep the surgeon’s skills in tip-top shape.